Christmas day isn’t complete without our tradition of opening to see what’s inside our stocking! I wrap the gifts inside and the kids love to see what trinkets await inside. Our stockings are pretty plain, but I’m inspired to make my own creative DIY Christmas Stocking after checking out what others had done with theirs. 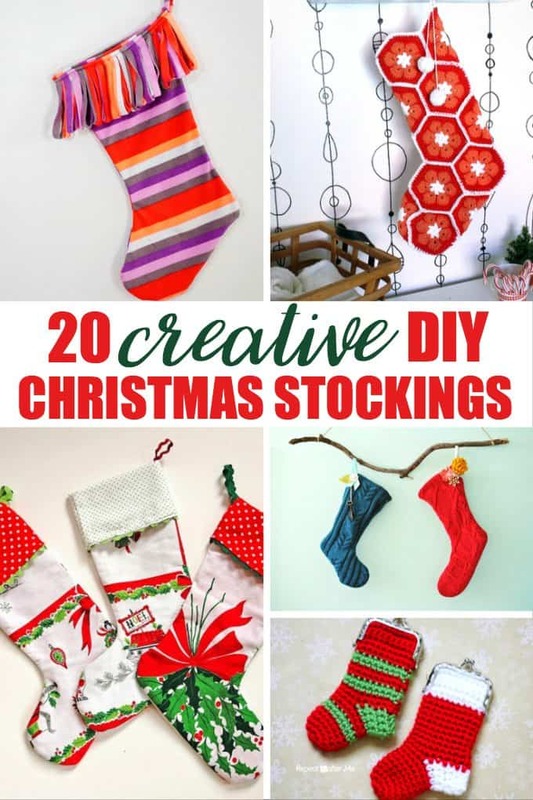 I’ve rounded up 20 of my favourite DIY Christmas Stockings to share with you today. The hard part will be deciding on which to make! They all look so nice. Which DIY Christmas stocking is your favourite from this list? Wow I love these! Very creative and what a great way to personalize christmas even more! Some of these are so cute. I made my ids and Grandson needlepoint stockings. They were a lot of work but a great keepsake. I have made Christmas stockings out of fabric for all my family including nieces and nephew. Sewing was my hobby until I retired and discovered contesting. Great collection of stockings to make. I like the ones made from sweaters (from anextraordinaryday.net). We have large red, furry stockings that my parents bought us, and stockings with our names on them that our friend knit for us when the kids were small. So I guess we don’t need any more, but I enjoy looking at the ones you selected. Great ideas. I like the Dimensions Crafts Counted Cross Stitch Stocking above. Some great stocking ideas, we need to get some new one at some point, Ours are getting old and a little worn.